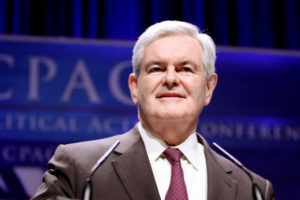 Seven Hillyer pieces from the Washington Examiner, starting with why Newt Gingrich might be right that Trump can win again. Links embedded within the headlines. Newt Gingrich may be right; Trump may yet win re-election: (Jan. 29) Even though Newt Gingrich’s political prognostications on some occasions have been spectacularly wrong, he shouldn’t be taken lightly when writing on Jan. 28 for Fox News that President Trump will likely win re-election…. Yes, ditch the joint session State of the Union speech (Jan. 28): Former Indiana governor and OMB Director Mitch Daniels merits a U.S. House floor standing ovation from both parties for writing last weekend that presidents should no longer deliver State of the Union addresses to joint sessions of Congress…. Federal debt bomb grows closer to detonating (Jan. 29): Not to sound like a broken record, but people should really be worried that the federal government keeps breaking records for annual deficits and long-term debt…. Trump will not blow up this White House ‘gofer’ (Jan. 30): Those of us in the Alabama political media world who long have interacted with Cliff Sims are far from surprised that the former aide to President Trump is now roiling the waters, earning Trump’s ire, and drawing threats of a lawsuit because of his “tell all” book on the Trump White House. Bama’s Gary Palmer has bill that merits bi-partisan support (Jan. 30). Yes, votes hate federal deficits (Jan. 30). … Now comes a survey by a respected pollster to say voters themselves say cutting the deficit is of utmost importance…. Non-citizens registered to vote in Pennsylvania and Texas show vote fraud is real (Jan. 31). Two large states are now reporting significant numbers of noncitizens somehow became registered voters, showing yet again that the biggest problem with voter-integrity measures is not that they are too tough, but that they are too lenient. For all Hillyer Examiner columns, go here.